Gripsweat - Forest - Full Circle - Harvest, "1 G/1 G" Mother/Stampers, Really First Press!!! Forest - Full Circle - Harvest, "1 G/1 G" Mother/Stampers, Really First Press!!! 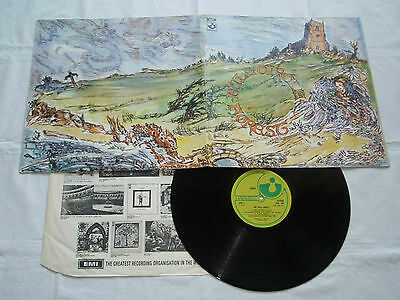 Very Rare Original UK Pressing With Textured Gatefold Sleeve, No "EMI" On Label & "HARVEST" Inner Sleeve! Printed Inside Sleeve - "File under POPULAR : Pop Groups"
Printed Inside Sleeve - "(P) 1970"
Printed Inside Sleeve - "Made and printed in Great Britain"
Printed Inside Sleeve - "7011 TPS Printed and made by the E. J. Day Group London and Bedford SHVL 784"
Text On Rim Of Label - "THE GRAMOPHONE CO. LTD..."
Text On Label - "MADE IN GT. BRITAIN"
Matrix/Runout - "SHVL 784 A - 2G/SHVL 784 B - 2G"
For The 3 O'Clock Position, HARVEST Use The Following Coding: "G R A M O P H L T D" Where G=1, R=2, A=3 etc. The Ultimate Early Pressing Would Be Denoted With The Codes 1 G/1 G (Side 1 And Side 2), Where The "1" Represents The First Mother (9 O'Clock) And The "G" Denotes The First Stamper (3 O'Clock). This Is One Of The First 300 Off Print!!!! Top Copy! Hard To Find In These Conditions! Please, Make Your Offer With Confidence! ALL MY RECORDS HAVE A FULL MONEY-BACK GUARANTEE, IF THEY ARE NOT AS DESCRIBED! THEREFORE, CAREFULLY READ THE DESCRIPTION! ALL RECORDS I SELL ARE LISTENED TO IN THEIR ENTIRETY AND ARE STRICTLY GRADED, ACCORDING TO "RECORD COLLECTOR" GUIDELINES. IMPORTANT: IT IS VERY RARE THAT I USE THE TERM MINT IN MY GRADING, BECAUSE IT MEANS UNPLAYED OR SEALED. FOR ME A RECORD THAT IS PLAYED ALREADY ONCE IS NO LONGER MINT. I Ship By Registered Mail With Tracking Number! Postage Discount For Multiple Purchases!